If you live in a humid climate than you likely struggle with mold and mildew issues in the bathroom. Fortunately, we’ve found an all natural recipe that helps remove mold and mildew. The key to keeping mold and mildew away is to clean frequently and wipe away excess moisture in the shower when possible. Using a squeegee to wipe away water that pools in your shower or bath is a good way to reduce moisture in between cleanings. Additionally, using a spray mixture of tea tree oil and water on a regular basis will help reduce mold and mildew growth. A recipe for daily maintenance using tea tree oil can be found below. We did have trouble removing mold and mildew that accumulates on caulking in the bathroom. If you know of an all natural solution for cleaning caulking, we’d love to hear from you! Combine baking soda and vinegar in a bowl. Pour your vinegar very slowly unless you want a volcano! Use the vinegar and baking soda to make a thick paste. Apply the paste generously over the mold spots and let it dry overnight. Add hot water and liquid castile soap to your bucket and use your cloth to remove the dried paste. Don’t forget your protective gear! 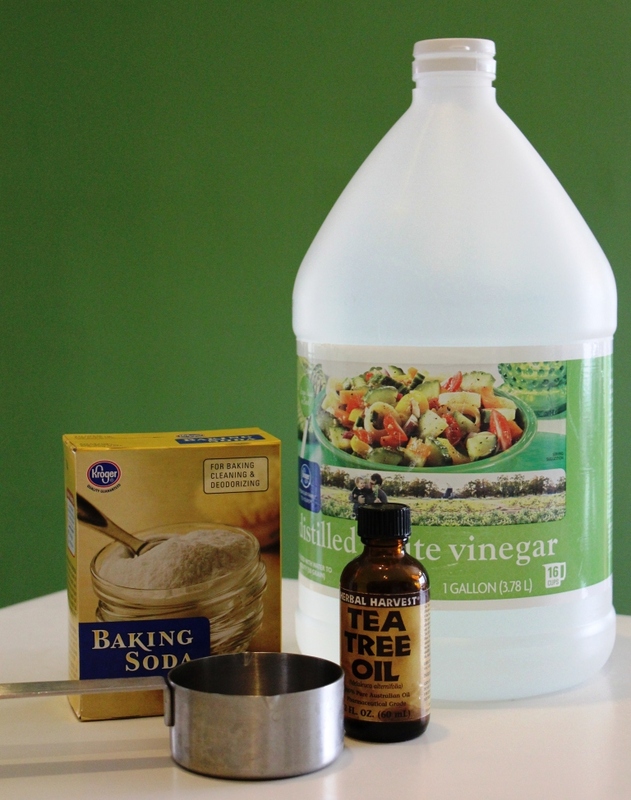 Pour water and tea tree oil in the spray bottle and shake it to combine the mixture. Spray the tea tree spray liberally in the shower or bathtub. Let it sit for 30 minutes and wipe away any excess moisture with a damp cloth. Tea tree oil has a very strong scent but it will dissipate in a few hours. Don’t forget to wear protective gear. water systems. Making natural toilet bowl cleaner is a simple and effective way to clean your toilet without harsh chemicals. There are two separate cleaners for our DIY toilet cleaner – one for the toilet bowl and one for the seat and surrounding area. The toilet bowl cleaner is very effective but without all the fumes and toxic chemicals associated with conventional cleaners. The toilet seat cleaner combines the antibacterial power of vinegar and tea tree oil to kill germs on and around the toilet. Shake the contents of the bottle to mix the ingredients. Spray on the toilet seat, handle and around the bowl. Wipe clean with a cloth or paper towel. Add 1 cup of full strength vinegar. Let it sit for 5 minutes to help dissolve scum and debris. Gently sprinkle in a cup of baking soda and let it mix with the vinegar for another 5 minutes. Scrub the toilet bowl and flush it when finished cleaning. No need to flush harmful chemicals down the toilet and into our water systems. Use this natural cleaner to keep your toilet clean and green! Pour in 1 cup of baking soda. Pour slowly so the vinegar and baking soda do not fiz too much. A clogged toilet is no fun! Most clogged toilets can be fixed with a plunger but when that won’t work people often resort to commercial products that are harmful to water supplies. Avoid the toxic chemicals and unclog your toilet with this DIY recipe! Add a gallon of boiling water in the toilet if the water level is not too high. If the water in the toilet has drained, then the solution has removed the clog. If the water remains, let it sit overnight and plunge if needed. Clogged toilets are the worst! Get your toilet working again with this all natural “Drano” solution. Natural mirror cleaner is a classic DIY cleaning recipe. What makes this recipe so great is that it’s simple and effective. It also allows you to re-purpose old newspapers rather than purchasing paper towels. Natural Windex is also big money saver compared to the cost of traditional Windex. A gallon (128 oz) of vinegar is approximately $3 (or less) which yields 8 32 oz bottles of mirror cleaner. The cost per bottle is only $0.38! The cost of a single 32 oz bottle of Windex which is $3 or more. If you were to buy 8 bottles of Windex it would be over $24. Even if you purchased generic Windex at the dollar store it would cost $1 per bottle verses $0.38 for the DIY recipe. Lastly, making your own mirror cleaner allows you to reuse the same spray bottle; cutting down on the number of plastic that will end up in a landfill or need to be recycled. Shake well to combine the vinegar and water solution. Instructions: Spray the mirror, bunch up the newspaper like you would a paper towel and wipe clean. It’s that simple! Do away with Windex and create your own low cost natural mirror cleaner! Spray mirrors and wipe down with newspaper for a streak-free shine.